Moscow, Sep 18 (Punjab Mail) – Russia’s ruling party on Sunday looked set to dominate a new parliament made up of Kremlin loyalists after a state exit poll gave it almost 45 percent in nationwide elections. 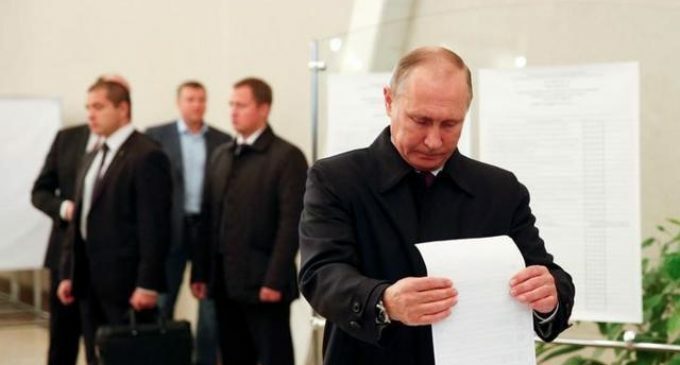 Russian state pollster VTsIOM put President Vladimir Putin’s United Russia on 44.5 percent, ahead of the ultra-nationalist Liberal Democratic Party on 15.3 percent, the Communists on 14.9 and A Just Russia on 8.1. “We can confidently say that United Russia has won,” Prime Minister Dmitry Medvedev said on state television, adding that the party would have an “absolute majority” in the new legislature. The four leading parties — which made up the last parliament and all back the Kremlin — were the only ones that cleared the five percent bar to claim half the seats up for grabs. Opposition party Yabloko received 3.5 percent of the vote, missing the threshold required to enter parliament. The Parnas opposition party, headed by former prime minister Mikhail Kasyanov, got 1.2 percent of the vote.